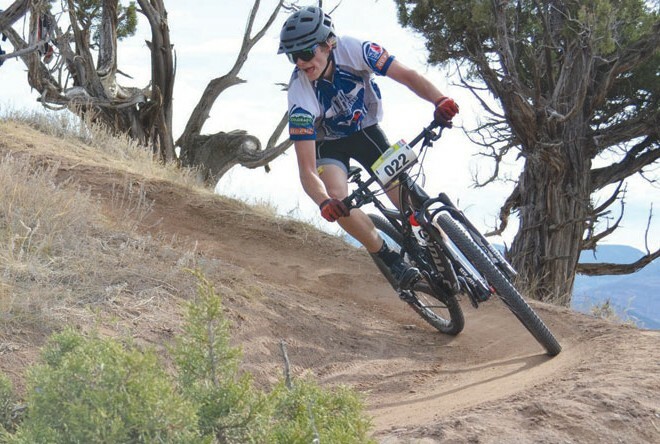 The Crested Butte high school mountain bike team finished up the 2015 season at the state championships in Eagle last weekend with two riders cracking the top 10 and the team placing fifth overall. The team put the finishing touches on their season’s worth of workouts the two weeks leading up to the finals and coach Torrey Carroll felt they were as ready as they possibly could be for the big race. “We did more of the same in the first week, intervals in the flats and false flats and the last week we tapered pretty well,” says Carroll. But jumping into the big pool of the state championships can make for tough riding and Carroll made sure his kids were mentally prepared for the task at hand. Ultimately, Carroll reminded the team that they were there to race hard, but also have fun and he kept the team relaxed, bowling some frames the night prior to the state championships. When they woke up for the race temperatures were in the 30s but climbed up to the 50s for most of the races and thanks to recent rains and some trail work, the course was in great condition and a little bit longer than usual. Kai Sherman closed out his high school mountain bike racing career battling in the finals of the varsity class race. The varsity race was a series of four laps on the 6.3-mile course, making for over 25 miles of riding completely pinned. Sherman started out on fire and was battling in the top 10 after two laps but forgotten lactic acid tablets and the high-speed pace eventually took its toll on Sherman as he cramped on the fourth and final lap but still gritted his way to a 21st place finish. “He was bummed but he still had a good day,” says Carroll. 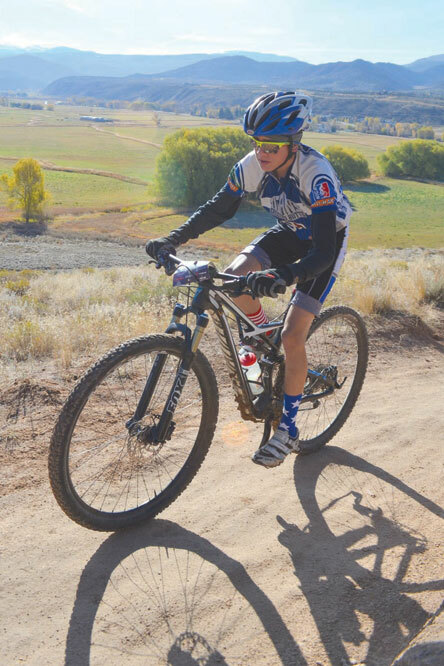 The top result among the Crested Butte riders came compliments of James Bivens in the sophomore age class. Bivens rattled off numerous top three finishes in the Southern Division all season but the championships were the first time he would line up against both the Southern and Northern divisions. Bivens rolled through the start/finish area in seventh place after the first lap but posted the fourth fastest second lap time to climb up three spots and finish the day in fourth place. Trouble hit a couple of the other Crested Butte sophomore class racers but they managed to still overcome and finish strong. The chain popped off Ian Eldridge’s bike in the opening double track sprint so once he was able to get back on his bike, he turned onto the single track in last place. Nevertheless, Eldridge managed to reel in riders over the course of the first and second lap, passing over 40 riders to finish in 31st place. “He didn’t get down psychologically and rode all the way up to 31st,” says Carroll. Finn Wilson suffered a similar fate, getting tangled up with his fellow racers at the start, but worked his way up to a 55th place finish out of the 140 sophomore racers overall. Freshman Marion Chater gained additional experience in her final race of her first year of mountain bike racing. According to Carroll, nerves tend to get the best of Chater on race day. She turned nerves into energy on the first lap of her race but the effort eventually caught up with her on the second lap. Chater still hung in there to place 32nd overall, scoring additional key points for the overall team score. Additional issues hit the freshmen boys for Crested Butte. Tanner Perkins finished the regular season in second place overall in the Southern Division and was poised for a standout performance at the state championships. But, misfortune reared its ugly head as the rider in front of Perkins fumbled during the start, costing Perkins to fall back over 20 spots before he even got going. Given the early need for speed, Perkins buried himself to move into eighth place before reaching the turn onto the single track. “He had to dig really deep to do that,” says Carroll. Perkins continued to climb up a few more spots but by the close of the second lap, his early burst had put the hurt on him. But he held his spot through the second lap to finish in fifth place. “He hung onto fifth place and that’s a good result,” says Carroll. Liam Elliott finished the day in 28th, Ethan Carroll rallied from a crash on the second lap to place 67th and Luke Shull suffered a flat tire and had the wrong tube but got the right tube eventually and crossed in 127th place. “We had some racers that overcame issues and responded well and they all had fun,” says Carroll. Carroll believes overall the team had a great season taking second place in the Southern Division and fifth place in state. “Definitely exceeded my expectations, I was really pleased,” says Carroll.